Butcher Babies’ singers Carla Harvey and Heidi Shepherd share their opinion on the horrific Las Vegas shooting and gave The Roman Show a heads on what to expect on their upcoming new album. 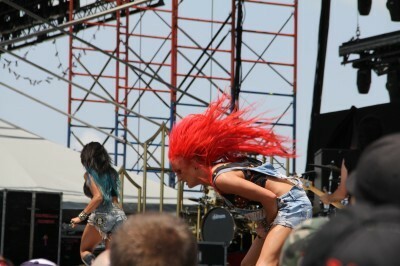 Butcher Babies is currently on tour with Demrick and Hollywood Undead. Their new album Lilth drops later this month. They both spoke to The Roman Show after their concert at Culture Room in Fort Lauderdale, Florida. Harvey shared her thoughts on the Las Vegas Shooting. A gunman opened fire at a country music concert and killed nearly 60 people in Las Vegas, Nevada this week. The band is set to release Lilth and has been playing new music on the road. Harvey said fans can expect a mixture of sounds. Shepherd said it was great working with fame producer Steve Evetts. Hear more of the interview as the band talks about art, writing and more.